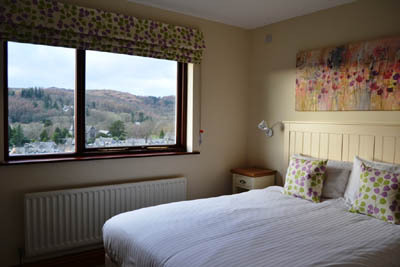 The Lakelands offers an excellent self-catering experience, and enjoys stunning views of the town and fells beyond. There is a selection of one and two bedroom apartments, and 2 superb four bedroom houses sleeping 8 people. Our guests enjoy full access to the onsite leisure centre and complimentary wifi. 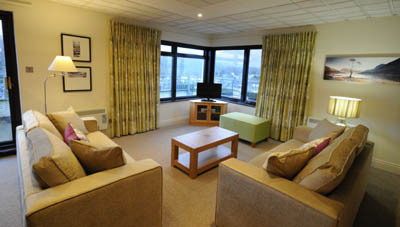 The Lakelands has everything you need for a great self-catering holiday in the heart of Ambleside. A stay at the Lakelands includes full use of the swimming pool, sauna, steam room and sunbed.The pool is 10×6 metres, with an adjoining children’s pool, jacuzzi and patio area, and is open daily from 7 until 11.30am, then 1pm until 9pm. All apartments have an outstanding view, together with a patio or balcony with outdoor furniture, plus private parking space. One-bedroom apartments sleep up to 4 adults, and the two-bedroom units sleep up to 6 adults, using pull-down double beds or sofa beds. All bed linen, towels and pool towels are supplied. On the left is a typical living room, with unobtrusive dining area and separated kitchen. The living area is spacious, fully heated and double glazed with plenty of storage space. Video, CD and colour TV are provided for your entertainment. 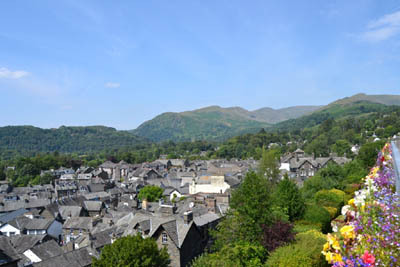 Ambleside town centre is just a few minutes walk away, with all essential amenities, including banks, restaurants, cinema and pubs, plus a wonderful variety of specialist shops. Prices from £240 to £855 for one week – special 3 night breaks from £175.